Warning: Spoilers ahead for Star Trek: Discovery. Jason Isaacs has left the door open to a future Star Trek: Discovery return after his character's recent demise. 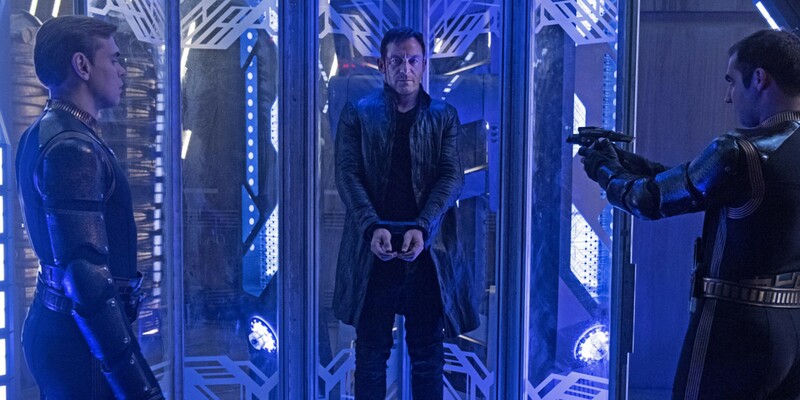 Discovery has delivered revelation after revelation since returning from its winter break and arguably the most significant was the reveal that Captain Gabriel Lorca was actually from the Mirror Universe. Indeed, it transpired that Mirror Lorca was a political fugitive in his own world after attempting a coup against the tyrannical Emperor. After accidentally arriving in the Prime Universe via a transporter malfunction, Lorca engineered the rescue of Michael Burnham and forced a return to his own world, all with the aim to taking another shot at Terran glory. Although he came close to succeeding, Emperor Georgiou had other ideas and drove a blade squarely through Lorca's chest. Despite still being in its first season, Star Trek: Discovery has a strong history of resurrecting characters believed dead in one form or another. The Discovery's Chief Medical Officer, Hugh Culber, managed to return briefly in ethereal form after dying at the hands of Ash Tyler, all thanks to the wonders of the Mycelial Network. Meanwhile, the Mirror Universe has provided the chance for a variety of Discovery actors to reprise their roles, including Michelle Yeoh's Georgiou and Rekha Sharma's Landry. "I said yes to a fantastic story. You never quite know with television because it’s written week by week. I thought the writers really delivered a fabulous, interesting story, and for me as an actor, I had just a banquet every scene. If they came up with a great story, I would be all ears." Isaacs' comments seem to suggest that there is nothing in the pipeline just yet for Lorca's return and given that the show recently revealed that the Klingons beat the Federation while the Discovery was in the Mirror Universe, this makes total sense as there are other storylines currently on the boil. Furthermore, with Emperor Georgiou being taken back to the Prime Universe by Burnham, there is little need for another Captain on the deck of the Discovery. Sorry, Saru. However, a future return for Isaacs and Lorca seems inevitable, albeit perhaps not until season two. A huge question mark still hangs over the fate of the Prime Universe's version of Captain Lorca. While it could be assumed that the man died along with his crew on the Buran, this has yet to be revealed explicitly and until such time, it would be wise to assume that Prime Lorca will appear sooner or later. Hopefully when he does, he's not a massive racist like his Mirror counterpart. More: Star Trek: Discovery: How Can The Klingons Be Defeated? Star Trek: Discovery continues February 4th on CBS All Access.